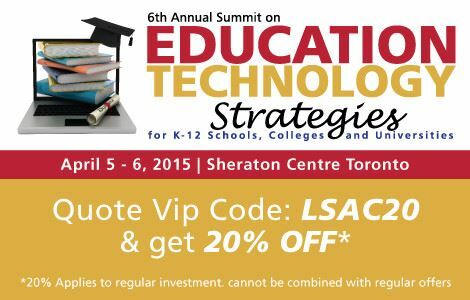 LSAC is pleased to partner with the 6th Annual Summit on Education Technology Strategies for Colleges, Universities & K-12 Schools taking place in Toronto on 5th and 6th April 2016!Engage in two days of top programming with specialized tracks and 35+ speakers and 20+ Leading Institutions from across Canada and around the world. Join this influential conversation and be a part of the movement to develop bright, creative and engaged students through technology. Source solutions to your top challenges in education technology design and implementation.